geoMap allows you to draw vector maps in Processing. Unlike images, vectors define the shape of each object in the map and so preserve their detail when magnified. To draw such a map you first need to find some mapping data to use. geoMap reads shapefiles which are a standard format for digital mapping and GIS (geographic information systems) data. There are plenty of free sources of shapefiles including Natural Earth, Global Administrative Areas (GADM) and openstreetmap. You may find that the shapefile you wish to use contains more geographic detail than you need, and as a consequence is slow to draw or the file size larger than you wish. A useful resource is mapShaper, which will allow you to simplify any shapefile, reducing the geographic detail but shrinking file size and speeding up drawing. A shapefile actually consists of several files all with the same name, but with the extensions .shp (storing the geometry of the map), .dbf (storing the attributes) and optionally .shx (an index file). To use a shapefile with geoMap you need to place at least the .dbf and .shp files somewhere where your sketch can read them (e.g. by dragging them into your sketch). The geoMap library comes with some sample shapefiles so you can build some sketches quickly - a world map (world.shp/dbf), a map of the US (usContinental.shp/dbf) and a map of London's boroughs (londonBoroughs.shp/dbf). GeoMap geoMap;                // Declare the geoMap object. geoMap = new GeoMap(this);  // Create the geoMap object. 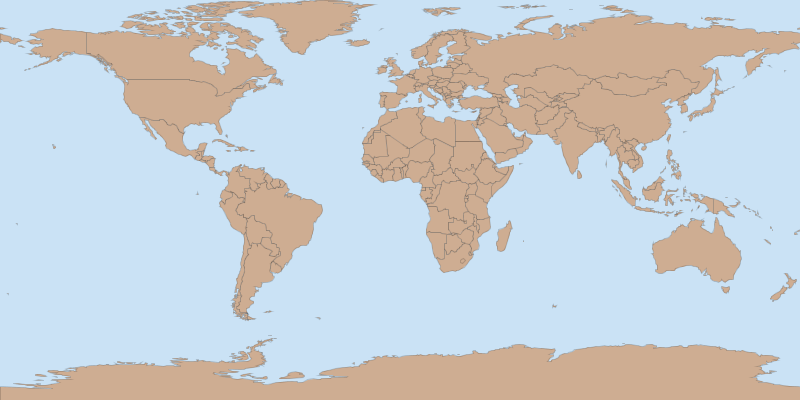 geoMap.draw();              // Draw the entire map. To use geoMap you must first import the geoMap package (line 1). Because you will probably only need to read in data into geoMap once, but draw it many times, you should declare a geoMap object at the top of your sketch so it is visible to both the setup() and draw() methods. The geoMap is created in setup() with the line new GeoMap(this) and then data from the shapefile are read into it with the readFile() method (in this example the sketch will look for a shapefile in its data/ folder called world.shp/world.dbf). Drawing the whole map is as simple as calling the draw() method of your geoMap object. noLoop();                  // Static map so no need to redraw. Small map using the (x,y,w,h) constructor. One of the advantages of vector-based mapping via shapefiles is that each item in the map is individually identifiable. We can exploit this to make our map interactive, highlighting the country under the current mouse position. // Find the country at mouse position and draw in different colour. fill(180, 120, 120);      // Highlighted land colour. Each item (a country in this example) in a geoMap object will always have its own unique numeric ID. There are a number of methods that can use this ID. The key line in the example above is the one that calls getID(mouseX, mouseY). Here geoMap will return the numeric ID of the map item at the given screen coordinates (mouse position in this example). We can then use this ID to draw, in a different colour, just the item selected. If there is no item at the given (x,y) coordinates, the method will return a -1, so we test for that to ensure we only draw when a map item has been found. We can take our interactive map one stage further by performing a query on the table of attributes associated with each map item. This table is stored inside the shapefile and the geoMap library provides some methods to make querying it easier. // and highlights selected countries. // Set up text appearance. // Display the first 5 rows of attributes in the console. // Draw entire world map. // Query the country at the mouse position. Finally we will pull together querying of the attribute table and drawing of individual map elements by creating a thematic choropleth map that colours each country according to some data value associated with it. It comprises three columns - the country name, its three-letter country code and the average number of unhealthy teeth per 12 year old girl. We need a way to relate each map element ID to the data in this cdv file. One way of doing that is to use the three-letter country code, which is present in both tables, to relate them together. This is more reliable than using the full country name since it avoids mismatching different spellings (e.g. St Vincent vs Saint Vincent). // Extract attribute in 3rd column for each ID. We can then use Processing's Table class to find the row in which that country code occurs and extract the corresponding teeth data. There is a possibility that a country code in the geoMap attribute table will not be present in the tooth dataset, so we also need to check for 'null' rows returned by Processing's findRow() method. We can create the choropleth map by setting a fill colour for each country according to the tooth value we have just extracted. A simple way of doing this is to scale the tooth data between 0-1 and then use Processing's lerpColor() to choose a colour between light and dark blue depending on that scaled data value. The complete sketch is shown below. //  Draws a choropleth map of dental health data from gapminder.org. geoMap.writeAttributesAsTable(5);         // Display first 5 rows of attribute table in console for checking. tabBadTeeth = loadTable("badTeeth.csv");  // Read dental health data. // Find largest data value so we can scale colours. maxColour = color(49, 130, 189);    // Dark blue. else                   // No data found in table. noLoop();    // Static map so no need to redraw.